Here's the little promo/artists talk featuring Damien Hirst for his new Supreme deck series that will be released this week on Thursday in store and online (Thursday April 2nd). The decks will be available in Japan on Saturday. 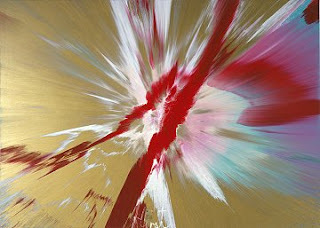 For those not familiar with Hirst's work he is best known for his Spin paintings created by centrifugal force. Essentially Hirst places his canvas on a spinner and pours paint on the piece and let's the forces of nature act upon the piece. It is this style that was utilized to create this three piece series.